Gaia Herbs Ashwagandha Root is up there in the ranks in terms of quality. The brand is trusted by many reviewers and is considered to be one of the leading manufacturers of natural products. Reviewers generally enjoyed this product. 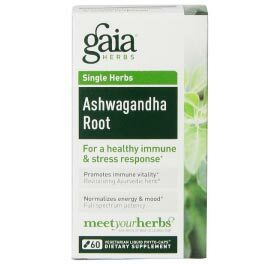 One serving of Gaia Herbs Ashwagandha Root recorded 350 mg of ashwagandha root extract containing 2.5 mg of withanolides (1.5%). Overall, Gaia Herbs Ashwagandha Root passes our review ratings with flying colors. No extra added ingredients in the capsules, effectiveness is a little bit on the low side when compared to other products on the market but it still can get the job done. Quality is there, good brand, well known, sold it many retail stores. This product passes our ingredient rating review. Contains a blend of extracts, 167 mg containing 1.5% of withanolides, and 183 mg extract, totaling 350 mg of ashwagandha. As you can see below the ingredient profile is simple, pure, and clean. Vegetarian Liquid Phyto-Cap is made from cellulose from pine bark. Research shows that a product containing a root powder or a root extract that contains at least 0.3% and 1.5% of withanolides a key marker compound which may also play a role in the herb’s activity. Typically 10 mg to 30 mg of withanolides per serving. Per capsule this product does fall short of the required threshold. One serving of this product recorded 350 mg of ashwagandha root extract containing 2.5 mg of withanolides. This product passes our quality review, no unnecessary ingredients, gelatin free, uses vegetable capsules. Trusted brand with many years behind them. Can be found in many retail stores around the USA.